Items are shipped through USPS Priority and International Priority, unless another mailing service is requested by the buyer. Items must be return in the same condition was sent out, and with all items. Please return within 7 days after item recieved. Contact me before making any returns. Bestgoodsathand is a store dedicated to provide costumers with great savings and good buyer to seller communication. Store is just opening at this site, but I been selling in multiple websites, like EBAY, Bonanza, ioffer and other sites. 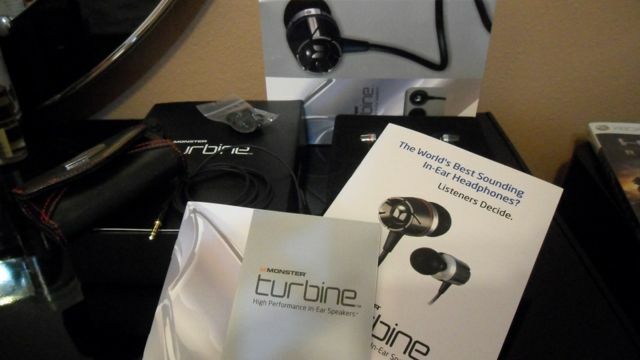 Monster Turbine in earbuds, 3 different- sizes eartips, traveling/protective case, owners manual. Items comes with 3 different- sizes eartips instead of 5 and box comes unwraped. Thats why am able to give you these prices. 24k Gold Contacts which gives a greater singnal transfer in comparison to other earbuds out there. All answers will be answered within 48 hours.